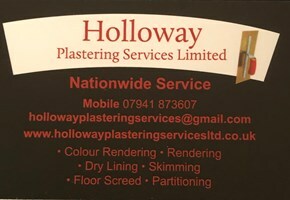 Holloway Plastering Services Limited - Plasterer based in Rowley Regis, West Midlands. Here at Holloway Plastering service we specialise in all aspects of plastering, rendering & floor screening. We aim to give our customers a top quality service for a fair price, whether it be a domestic or commercial project. We are a family run company that was established in 2001 and have 26 years of experience in the trade and consider every job to be of equal importance, whether it be a small patching job or a full house refurbishment our customers can be sure to receive a top quality service. We provide all of our services nationwide and we are recommended throughout the country, we are also approved by British gypsum so you can be assured of a top quality job. So don't hesitate give us a call today for your free quote.